We’ve visited more wineries while traveling than might be healthy for two people. Every time we visit a winery that we love we want to purchase a case of wine (maybe two). Now that we live surrounded by an amazing Catalan wine region, it’s not a problem. But, when we are traveling, there is always the problem of how to go traveling with wine. 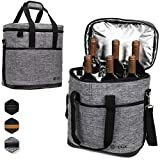 Whether driving with wine or flying with wine, a lot goes into figuring out what is the best wine travel bag, and that can include wine luggage or a wine suitcase. But it also can include a wine carrier bag, or just packing wine in a suitcase. In this wine carrier bag buying guide, we are going to walk through how to pack wine bottles in a variety of ways. This will cover everything you need to know about taking wine on a plane, as well as advice on how to protect wine on the ground with a wine bottle carrying case. Are You a Wine Professional? How Often do You Travel With Wine? How Many Bottles do You Want to Carry? There is a lot that goes into bringing wine on a plane. Unfortunately, most international flights don’t permit wine in carry-on luggage unless it’s purchased from duty-free. Whether you want to learn how to pack wine in luggage or purchase official wine luggage that is made for transporting wine, we can help. Below we cover in more detail the different wine bottle packing options, but if you are looking for some quick recommendations for a wine carrier bag, here are our top recommendations. We recommend using Amazon for purchases like this. First off, they deliver around the world. Second, if you have Amazon Prime many of these products ship for free. Before we share reviews for each of the options we cover in the wine luggage buying guide above, there are a few questions to answer to narrow down your needs. Then, take a look at the descriptions of each of the options below to determine the best wine luggage that fits your needs. All of these suitcases can be bought on Amazon. I recommend reading all of the product descriptions on Amazon to make sure it fits your needs. 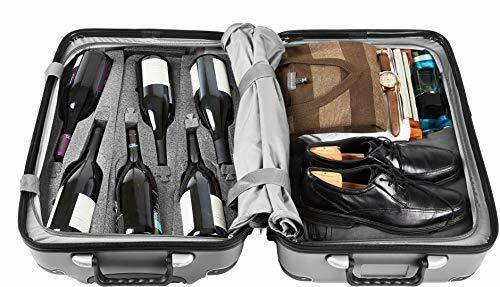 If you are a wine professional who travels regularly with high priced bottles of wine, then the best wine travel suitcase is one for wine professionals. In this case, invest in something durable and sturdy. Ensure that the bottles will be safe within the padding of the suitcase. This is important anytime you check wine with an airline as baggage handlers might not treat it like the precious cargo we think it is. Although the TSA does not place restrictions on the amount of wine you can travel with, the airline might place restrictions on the total weight you are allowed to check. Last, if you are a wine professional, you probably want to focus on a 12 bottle wine transport luggage, something made for professionals. Although there are days when I feel like a wine professional, particularly when I look around at our overflowing wine racks, I am not. Many wine travelers are merely wine enthusiasts. They travel to a destination, visit wineries, and fall in love with a handful of wines that they want to bring home with them. This is us. The question is how often do you do this. If you travel to several wine destinations a year with an intention of bringing wine home, then it is worth it to invest in a quality wine luggage bag. This is probably the most important issue to consider when purchasing a wine travel case. Last, how many wine bottles do you plan to travel with? If you plan to travel with six or more bottles on a regular basis, then it’s probably time to think about investing in proper luggage. 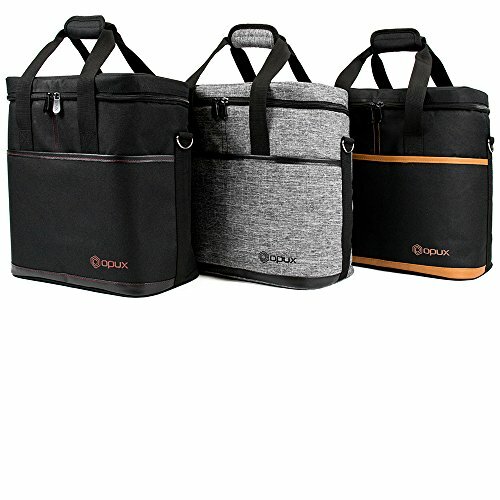 If you are an occasional wine transporter, we recommend some more casual options as well below. 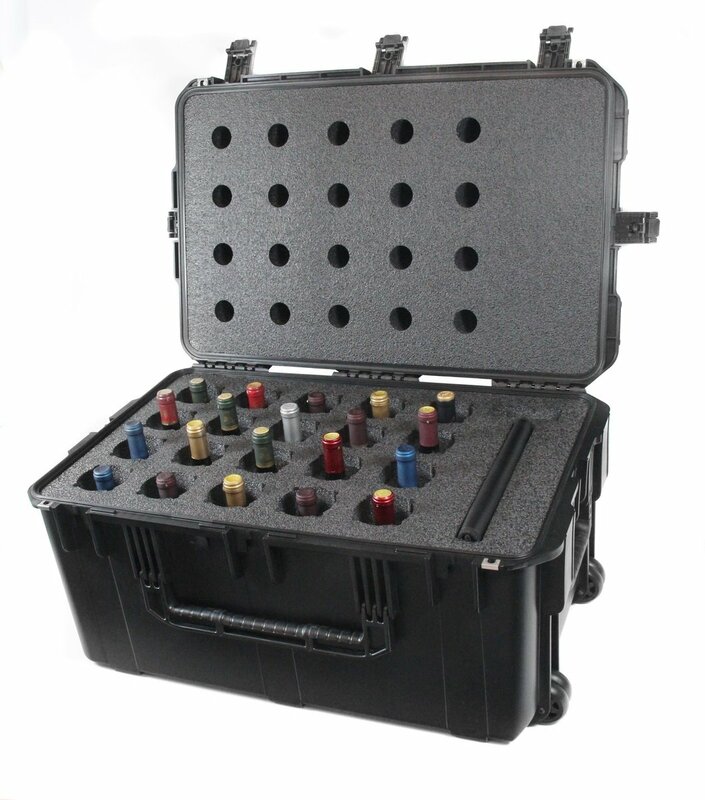 When looking for a serious wine travel case, there are a few options. Most of these are hard-sided wine travel suitcases. Rather than placing the wine in checked luggage, for wine travelers who know they are going to be purchasing wine, a wine luggage carrier is a great choice. Admittedly, this is for some serious wine purchases, perhaps someone traveling to Bordeaux or Champagne. But, really, it can be for anyone who knows they will be buying 12 bottles of wine that they plan on checking, and want to bring home safely. There are two primary types of wine carrying case that can be considered wine luggage. One looks like typical wheeled luggage, and the other looks a little more hard-core. Both are hard sided, have wheels, and will protect even the most expensive wine. This is the most serious wine luggage options. 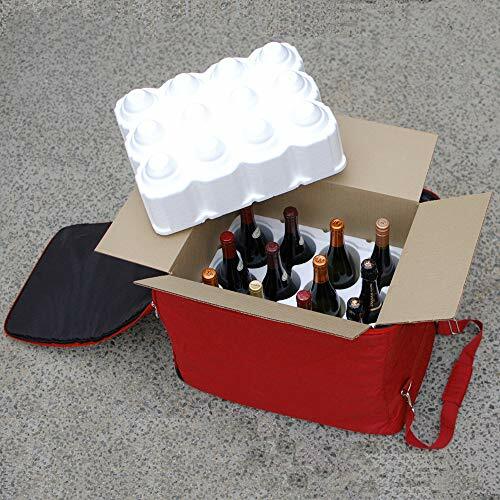 The CasePro 12 Bottle Wine Carrier with Wheels holds 12 bottles and is thermally insulated to keep the wine bottles at the perfect temperature during a flight. And, there is a wine accessory space to hold corkscrews, aerators, and other accessories that you can’t carry on. 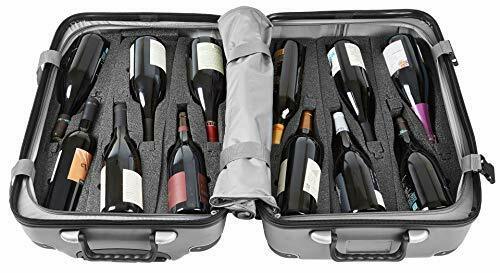 This wine luggage also works well for the traveling wine professional in addition to the wine traveler. The second option for a wine bottle carrier that is less for a wine professional, and more for a wine collector, looks and acts like traditional luggage, but it can, of course, hold wine. The VinGardeValise Grande 12 Bottle Wine Travel Suitcase is one of the best wine luggage options on the market. It’s super slick, with 360-degree spinner wheels. It holds up to 12 bottles of wine, or 10 bottles of wine and two Champagne-sized bottles. It also has a TSA approved lock to keep your wine safe when traveling. And, you can actually add clothing and toiletries into the bag, so it’s not entirely dedicated to wine. If the 12 wine bottle luggage carrier is a bit large, VinGardeValise also makes a VinGardeValise Petite 8 Bottle Wine Travel Suitcase. It has a lot of the same features as the larger version. And, the newer VinGardeValise suitcases include one year of HomingPin lost luggage locator service. This is important if you plan to travel with high-value wine. Check the latest prices here. 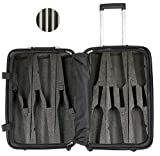 If looking for something a little more like a wine bag than wine luggage, this Wine Check Luggage Complete Set is approved by the US FAA to be checked as wine luggage. 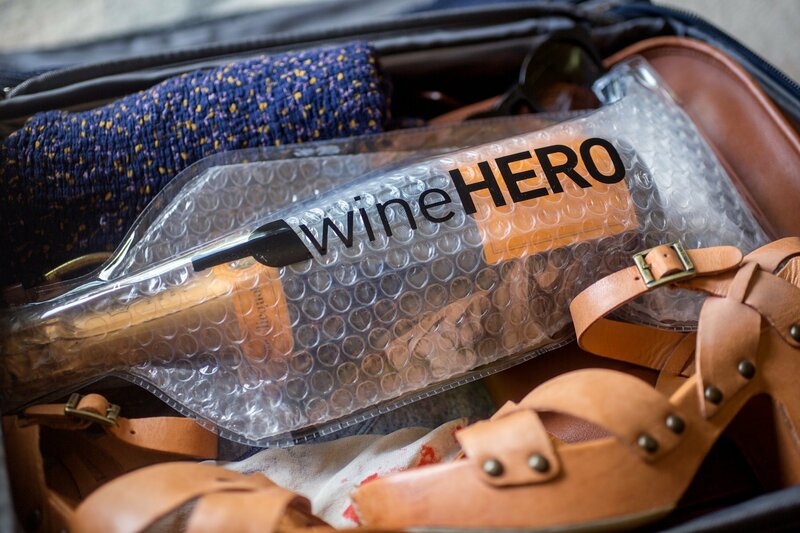 The wine bag is collapsible making it easy to take on the outgoing flight, it’s reusable, and lightweight, weighing under 5 pounds. And, even when packed with a full 12 bottles, the bag will still be under the 50-pound luggage limit for most airlines. The wine bag also has wheels to make it easy to transport. Check the best prices here. This wine carrier bag is more for on-the-ground travel. A wine bottle cooler bag allows you to travel with crisp, cold wine for any occasion. This insulated wine bag holds six bottles of wine in a water-resistant should bag. And, the liner can be removed to transform it from a wine carrier bag to a traditional beverage cooler. One thing to note, this bag cannot be used as checked wine luggage. I am including it as an option for people who oten drive with wine in their cars (we do!). The other wine travel solutions and wine carrier bag options are pretty intense for serious wine travelers (of which we are proud members). But sometimes it makes more sense to consider packing wine in a suitcase instead of purchasing a separate wine suitcase to travel with. Many people who purchase wine while traveling might only travel with a bottle or two. Or, they might be traveling with a bottle of gin or other liquor. In this case, the solution is more similar to how to package wine for shipping – carefully. These are some of the handiest tools out there. They are like wine bubble wrap, and how fun does that sound? There are different kinds of wine bottle travel protectors that can be placed inside your own luggage. And, this one in particular, let’s you be a Wine Hero. 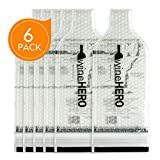 These are a safe solution that is the perfect alternative to attempting to wrap a single wine bottle in loads of plastic bags at the last minute. They are almost like bubble wrap, where the wine traveler just slides the bottle into the sleeve and seals it shut. The wine bottle protector is then sealed at the bottom, which not only protects the wine bottle from breaking, as well as guarantees no spillage. They pack flat until they are ready to use, which makes them easy to travel with on the outgoing flight. They also work for liquor bottles, olive oil, vinegar, and other liquid food souvenirs. Last, they can be used on the ground as well when transporting bottles to ensure they arrive safely. How many bottles in a case of wine? This is important to know when thinking about transporting wine. It depends on the location of the winery. When we lived in the US we received regular shipments from wine clubs, many of which included 12 bottles of wine in a case. In Europe though, and particularly in Spain and Italy, many wineries offer a 6 wine bottle case. This is important to understand only when ordering wine for shipment rather than traveling with wine bottles. Can you bring wine on a plane? There used to be more than one way to take wine on a plane. Now, it’s only possible to travel with a wine bottle in checked luggage. Can you bring a bottle of wine carry on? This is pretty much answered by can you take wine on a plane, above. Currently, due to security concerns and limits on liquids in carry-on luggage for international flights you can no longer pack wine in carry-on luggage. So, yes, you can take a bottle of wine on a plane, but only in checked luggage. Looking for other packing and travel tips?